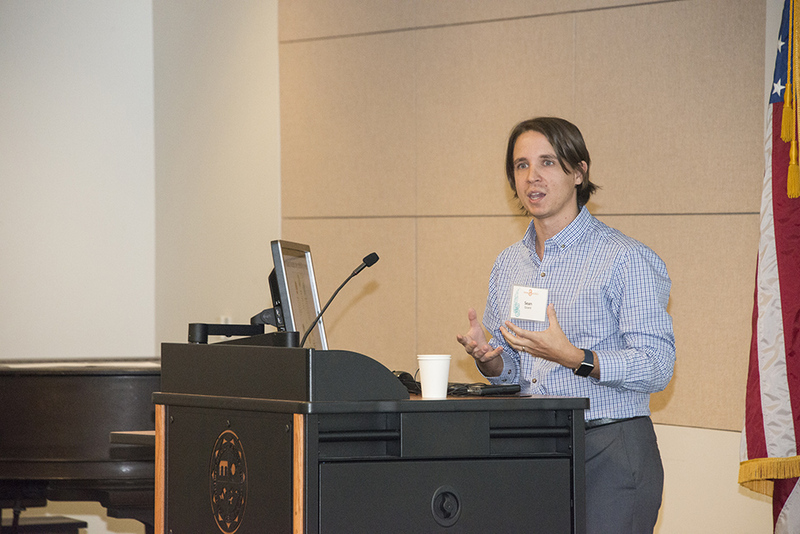 Keynote speaker Sean Grant, behavioral and social scientist for Rand Corporation, showcased the open access movement during Fourth Annual Open Access ceremony. Photo by David J. Hawkins. 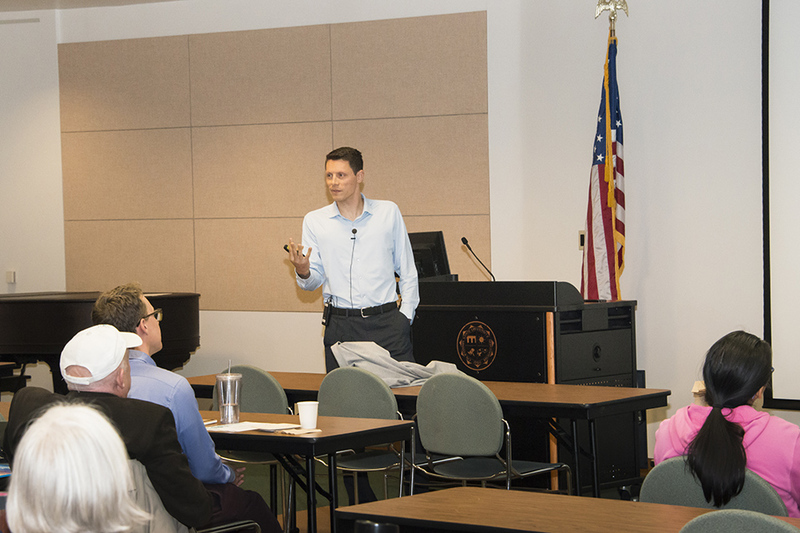 Psychology professor Abraham M. Rutchick discussed the evolution of open science and reproducibility at the Fourth Annual Open Access Ceremony in the Ferman Presentation room. Photo by David J. Hawkins. 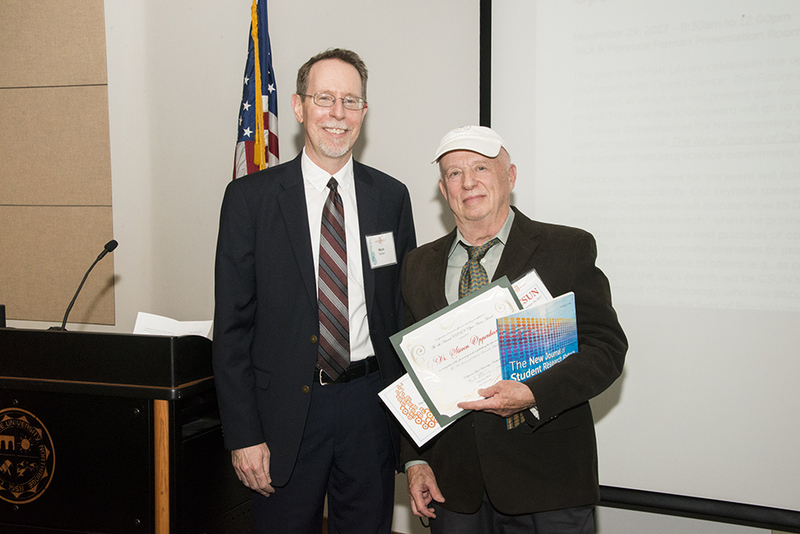 Mark Stover, Oviatt Library Dean, with honoree Emeritus Professor of Biology Steven B. Oppenheimer at Fourth Annual Open Access Ceremony. Photo by David J. Hawkins. Open science is a movement to make all scientific research, data and dissemination accessible online to all levels of an inquiring society, including amateurs and professionals. The open science and open access movements promote sharing the underlying research, materials and results of a scientific experiment with public audiences, so the research and results can be easily evaluated or replicated. Recently, educators, scientists and researchers gathered for The Oviatt Library Open Access: Open Science and The Future of Research and Education symposium, in the Jack and Florence Ferman Presentation Room of California State University, Northridge’s Delmar T. Oviatt Library. Rutchick conducted research on behalf of the Center for Open Science, a national nonprofit organization that concentrates on “increasing the openness, integrity and reproducibility of scientific research.” In his presentation at CSUN, he highlighted the evolution of open science and reproducibility with respect to the field of social psychology. The Open Access and Digital Publishing team of librarians at CSUN’s Oviatt Library helped plan the event. Library Dean Mark Stover helped kick off the festivities and award ceremony with opening remarks. Open access refers to free, online public access to scholarly and scientific works in journals and university repositories. CSUN ScholarWorks Open Access Repository (SOAR) provides a sustainable and scalable platform for the long-term access and preservation of digital resources. CSUN President Dianne F. Harrison was the first California State University president to sign the Berlin Declaration on Open Access to Knowledge in the Sciences and Humanities in 2013, encouraging the free and open dissemination of research and scholarship. Later that same year, CSUN became the first CSU to host a Faculty Senate-sponsored open access resolution forum. Steven Oppenheimer, CSUN emeritus faculty and legendary biology professor, received the Oviatt Library Open Access Award, which was presented during the recent symposium. The award was granted to Oppenheimer for his contributions to the world of science and education. Oppenheimer has been involved with CSUN for more than 40 years and impacted thousands of students with his scientific inquiries. His passion for science has helped introduce these inquiries to new generations of future scientists, researchers, doctors and teachers. Over the course of his prominent career, Oppenheimer earned more than $7 million in funding for research and training grants, which primarily benefit students. For the past two decades, Oppenheimer has acted as editor for The New Journal of Student Research Abstracts, which showcases the published work of thousands of student researchers in grades K-12. The symposium also included a keynote presentation by Sean Grant, behavioral and social scientist for Rand Corporation, on “How to do Transparent, Open and Reproducible Research.” A professor at the Pardee RAND Graduate School, Grant specializes in the advancement of the overall transparency, openness and rigor of intervention research for supporting evidence-based policy and practice. To learn more about CSUN’s ScholarWorks Open Access Repository (SOAR), please visit https://library.csun.edu/SOAR.